Title Card: At the beginning of the last century, the United States declared war on Spain. They pledged to free the island of Cuba, ninety miles to their south, from colonial rule. It was thus that the American troops came to yet another Spanish colony, half a world away. They decided to stay. I saw this movie at the film festival Copenhagen Pix on April 28 and I was pleasantly surprised as the movie is a return to form for John Sayles after the disappointing Honeydripper. I should explain that back in my college days I wrote my thesis on John Sayles so I'm obviously a big fan and have watched most of his movies at least five times. Lone Star, Matewan and City of Hope (the movies my thesis was based on) I have watched more than 50 times. I also met John Sayles a few years ago in Copenhagen and he was as pleasant as I had expected. When I told him that I'd written about him, he asked what the title was and upon hearing the academic mumble-jumble title (I forget) he just replied, "Yup, that'll work," and proceeded to talk about baseball and sports in general (upon hearing that I was writing about sports). Great experience to talk to him and I still consider Lone Star one of the five best movies I have ever seen. Anyway, back to the review. All in all Amigo is an excellent movie. Sayles' social conscience makes him a rather special and unique American director and if you don't know his movies you should get cracking. There are almost no bad movies in his work. 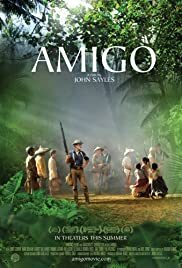 Amigo is well-cast and all the actors do a great job especially when you consider how close to Sayles' words they have to stick (Sayles may be a cool and laid-back guy but he is not a big fan of his actors improvising a whole lot) it all comes out so effortlessly. Obviously, it helps that the dialogue, as always, is brilliant. The first entry here on IMDb about this movie from usherontheaisle explains the plot better than I possibly could. As usual, Sayles is very balanced on the subject matters and he never takes the easy way out of any dilemma. The natives and their motives are likable but so are the soldiers and the rebels. Sayles explains in details the dilemmas of each group so that the audience understands everything from the perspective of each group. There are a tremendous number of characters that have a quite substantial part in the movie, another Sayles trademark, and this works well to get all the angles of the story exposed. This does require the audience to pay attention because sometimes a character will not be present for 30 minutes and then Sayles returns to him/her. Sayles is usually very ambitious in his movies' scope and Amigo is definitely no exception. He packs in so many facts in his dialogue and narrative that you sometimes feel you have been exposed to a history lesson while being entertained. The movie is gloomy and you have a feeling right from the beginning that it will end badly. Sayles is always rather pessimistic in his views on humanity and human behaviour – Men with Guns comes to mind – but he hardly ever blames anyone and that is also the case in Amigo. Even the sneaky Spanish preacher eventually shows his good side at the end of the movie. This is Sayles' way and if you read his books you will see that he writes in the same style. Sayles' character direction has always been amazing – how he gets so many unknown actors to perform so damn well I'll never know – and Amigo is no exception. The amazing and underrated Chris Cooper does a fine, small job as old school Colonel Hardacre ("Them gloves are coming off!") 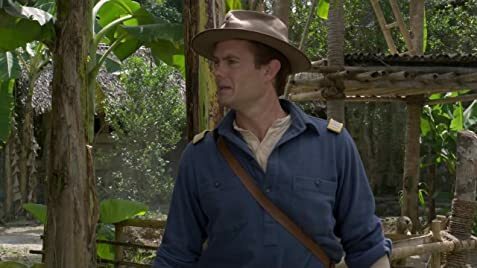 and so does Garret Dillahunt as Lt. Compton. But it is almost not fair to mention anyone as everyone of the actors are convincing and very capable. I realize that this does look a bit like a fanboy review but bear in mind that I really did not like Sayles' last movie, Honeydripper and I was not too thrilled about Casa de los Babys either. In my opinion this is Sayles' best movie since Lone Star. It is a bit on the heavy side at times and it does require a lot from the audience but there is a big return on that investment. Go see it. It's (almost) Sayles at his best.